Written in conjunction with ScreenPicks. 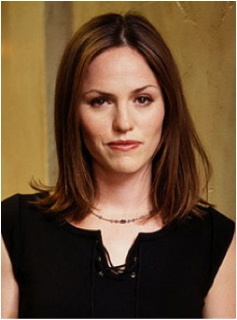 Jorja Fox, best know for her roles on CSI: Crime Scene Investigation along with The West Wing and ER, is also an avid environmentalist and conservationist. She is being honored this weekend with the Animal Champion Award for her work with Animal Defenders International. ADI has worked tirelessly to rescue and protect the abused and neglected animals across the globe. The event this weekend, called the Lion Ark Night will focus on the rescue mission performed last year where ADI uncovered and put an end to cruelty to circus animals in Bolivia. They went undercover to rescue 29 lions and airlifted them from South America to Denver. Price is Right former host Bob Barker funded the entire thing and he, too, will be honored this weekend with ADI's Lifetime Achievement Award. The entire rescue is being made into a documentary called Lion Ark and clips will be shown at this weekend's Hollywood Hills gala. In a recent exclusive interview, we spoke with Jorja about her work with ADI. We asked her about the event and she replied, "It's going to be a heck of a party… Bob Barker's going to be there. You can't beat that. I try never to miss a good party." Jorja talked about working with Bob, "He's a legend. He's the nicest man. He's funny. He's got great style. Every time I see him I'm wondering what he's going to be wearing. Maybe single handedly, more than anybody else that I know of, has been quietly contributing to causes that are very close to my heart and been contributing in extraordinary ways. Bob travels less than he used. He gets out in front of the public less than he used. And he's been making up for that behind the scenes. He has given incredibly generous gifts to several organizations over the last couple of years that have really allowed the organizations to stay afloat." While she fully supports the award being bestowed on Barker this weekend, she is less than enthusiastic about her own honor. She stated, "It feels really undeserved. I feel I have a lot more to do, a lot more to accomplish." But it seems to us that like Jorja has done plenty. She remarked, "Every time they call me, they call me for something extremely exciting." Aside form her involvement in the Lion Ark project, she has produced a documentary called How I Became an Elephant. It is the tale of a girl who travels to Thailand to rescue an elephant working in the entertainment industry. Jorja cautioned that this is not an isolated problem, but a global one. She pointed out that many animals in captivity are forced to live on concrete, which can kill them. She said countless elephants die in zoos due to of infection in their feet because they weren't designed to stand on concrete. She noted, "That's a crime. I think these animals deserve a lot better than that." Jorja also went to Capital Hill with ADI last year to launch the "Traveling Exotic Animal Protection Act." And she encourages all animal lovers to call or write their congressperson to support the bill which will protect animals in entertainment who travel and from state to state. She stated that they need a federal law to protect them because they fall through the cracks since each state's laws vary. She also emphasized the importance that the work of the ADI has not just for the animals but for humans as well. "We can't exist without wildlife. We're just completely kidding ourselves if we think we can go it alone without all these animals. And so looking after these animals is important to me for the sake of these animals but also for the sake of people and the future of this planet. I don't want to live on Mars." One of her goals is to eradicate certain animal institutions. "If I had my way, circuses and zoos would be a thing of the past in the way that we know them now. I think there's a place for those institutions in the future. But I don't think they'd look anything like what they look like right now." So we asked what they would look like in her version of the future. And while she acknowledged some habitats that already look like her dream there are many more that don't. "I'd like to see us moving under this umbrella term of 'sanctuary,' so a tremendous amount of more space, no breeding programs. The public being able to see them would still happen but it would be more removed. People would be in a more respectful, quieter space." And to Jorja the perfect circus is one without animals like Cirque du Soleil. She stated, "We have so much to learn from these animals. We haven't even begun to figure out what we can learn from them. But I know it's not about watching an elephant put a basketball in a hoop. I think we can do better than that." Tickets for Lion Ark Night 2012 on Saturday, October 13 are $150 and VIP tickets are $500 (which includes a VIP champagne reception). Get ticket here. Jorja's movie How I Became an Elephant is being screened in the Los Angeles area this weekend. Check the movie's website for details. And if you're in the New York area this fall, Jorja is producing a one woman show about Dusty Springfield. Find more information here.